The next formation that we encounter is the new red sandstone, the site of the old Forest of Sherwood. The ‘forest lands,’ past and present, of Nottinghamshire may be said to be synonymous with this formation. In some districts the sandstone is hard; in others quite loose, giving rise to ‘blow-away sand.’ It generally abounds in hard pebbles (quartzites), which ignorant rustics firmly believe to grow. The grains of sand are white quartz, and the present red colour is due to an external coating of the individual grains. The soil of the new red sandstone is for the most part poor and gravelly, and but for this fact, doubtless, the wide limits of the old Forest of Sherwood (Worksop to Nottingham Park) would not have been suffered to continue so long. The yellow gorse flourishes on and brightens the dry, barren and uncultivated tracts of this formation, which in its higher levels is, owing to its extremely porous character, singularly devoid of brooks and streams. The rainfall is rapidly absorbed, and as at the base of the sandstone impervious beds of marl occur, the whole rock forms a fine natural water-reservoir. As a water-bearing formation, it ranks third in England. The sand has not only all the powers of absorption of a vast sponge, but is an excellent filter. Many of the largest towns in England derive their supply of water from the new red sandstone. Some of the sand is excellently adapted for moulding purposes. 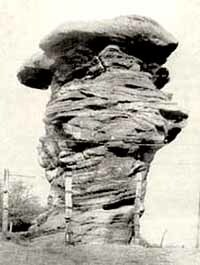 At Bramcote there is a high pinnacle of rock, known as the Hemlock Stone; at Blidworth there are similar pinnacles, commonly called ‘Druidical remains'. These pinnacles are masses of rock, locally cemented, and made intensely hard by a vertical dissemination of calcareous matter (contained in percolating waters) before the removal of the surrounding mass took place. The surrounding and softer mass has been gradually removed by subaerial denudation, leaving the harder or cemented portion standing in the shape of pinnacles—objects of interest to the geologist, and a wonderful puzzle to the superstitious and uninformed. The next formation we meet with is known as the ‘keuper marls.’ In the upper portion gypsum (sulphate of lime) occurs, and is worked as a commercial commodity at Beacon Hill, Newark, where this formation occurs capped by the ‘rhaetic beds.’ A fossil from the keuper marls of Nottinghamshire has been a long-sought-for ‘philosopher’s stone.’ The marls are largely worked for brickmaking. The sea in which these beds were deposited must have been surcharged with various salts, and (Sir Andrew Ramsey says) must have been an inland sea, like the Great Salt Lake of Utah or the Caspian. Large pseudomorphous crystals of salt are common in these beds. A fine section of these beds may be seen by the Midland Railway between Carlton and Nottingham. The last formation (to be met with on the eastern edge of the county) is the 'lias,’ a formation characterized by most striking regularity of stratification. It abounds in ammonites (perhaps the best known of all fossils) of various species. The various species occur at various zones as systematically as the arrangement of specimens in the different drawers of a cabinet. The ‘lias-plain’ extends to the base of the hill at Lincoln. This formation is the same as that existing at Whitby, Yorkshire, the ammonites of which place are celebrated. The limestones of this formation yield valuable hydraulic cement, and are extensively worked in some villages in the county. The officers of the Government Geological Survey have of late years made the discovery that the river Trent formerly flowed direct from Newark into the Wash by way of Lincoln. At Lincoln the river passed through the gap there in the long range of hills known as the Cliff. The gap was doubtless cut by the Trent itself at a time when the river Witham was its tributary. Trent gravel is a distinct deposit capable of easy recognition. A deep deposit of Trent gravel (the site of the old river-bed) has been found to extend from Newark to Lincoln, and forward to the Wash. It is impossible for this gravel, composed as it is of Derbyshire and Nottinghamshire rock materials unknown in Lincolnshire, to have become deposited in its present position but by the agency of a large river. The manner in which the river Trent became deflected from its ancient course is set forth in the Quarterly Journal of the Geological Society, 1883, vol. xxxix., in a paper by Mr. A. J. Jukes-Brown, B.A., of her Majesty’s Geological Survey. If a map of the county be examined, it will be noticed that the Trent from Nottingham runs for miles in a north-easterly direction, pointing to the gap at Lincoln; at Newark, however, the river takes a somewhat sharp turn to the north in the direction of the H umber, into which it now flows. There are in Nottinghamshire two public geological museums—one at the University Buildings, Nottingham, and the other at Southwell. The latter was a bequest by the late J. B. Warwick, Esq., M.R.C.S., and, though small, contains some choice specimens.